SEE THE UNIVERSE IN HD! 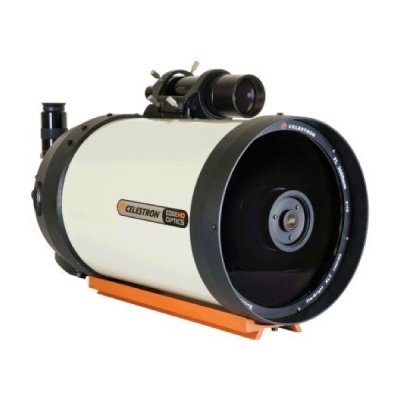 Introducing Celestron's New Aplanatic Schmidt Telescope Design! Many optical designs that advertise themselves as "astrograph" quality actually only produce pinpoint stars across a curved focal plane. While this may be acceptable for visual observing, stars will appear out of focus at the edge when used with a flat chip sensor of a digital camera. EdgeHD optics produce a focal plane more than three-times flatter than a standard Schmidt Cassegrain telescope and dramatically flatter than other competing coma-free designs. This guarantees you visibly sharp stars across some of the largest CCD chips available today. Superior edge performance not only creates rounder, more pleasing stars but actually improves the resolution and limiting magnitude when compared to telescopes of equal aperture. Starbright XLT® Coatings coupled with Celestron's StarBright XLT coating group on every surface, EdgeHD optics gives you maximum light throughput across the widest visual and photographic spectrum. In addition to Celestron’s new optimized optical design, the EdgeHD tube has been redesigned to make sure you get the most from your optics each and every night. Mirror Clutches - Flexible tension clutches hold the mirror in place and reduce image shift when rotating the tube around the mount. The flexible rods allow the mirror to be held in place without putting any force or pressure on the mirror assembly, keeping the image centered in the eyepiece (or chip). Tube Vents - Cooling vents located on the rear cell allow hot air to be released from behind the primary mirror. Each vent has an integrated 60 micron micro-mesh filter guaranteed to let warm air out without letting dust in. Fastar Versatility - The EdgeHD is the most versatile imaging scope available today. At its native f/10 you can achieve the image scale necessary to capture the smallest of deep sky objects. With the optional reducer lens (coming soon) you can increase your field of view without sacrificing optical performance. A barlow gives you the added power for high resolution planetary, lunar and solar imaging. And of course all EdgeHD optical tubes are Fastar® compatible for ultra fast f/2 wide field imaging. Each tube has been fitted with a removable secondary mirror and are opto-mechanically aligned on a laser bench to ensure they are axially symmetric in any configuration. Mirror Support Knobs hold the mirror in place and reduces image shift during imaging. Tube vents with integrated 60 micron mesh filter allowing hot air to be released from behind the primary mirror.